I love Twilight! I'm SAHM that babysits for a living and suffice it to say, I need a life! Lol ;) I'm taking college classes to get a degree in English and hope that will help my stories flow better. 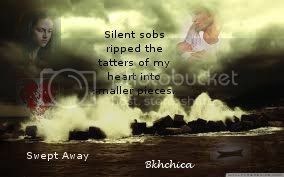 Silent sobs tore from my throat, ripping the tatters of my heart into smaller pieces. Eventually, what was left was going to look like the sand in my yard- so small that even a breeze could pick it up and blow it away until what was inside matched what I wanted to feel- nothing.